The time has now come to say an enormous GOODBYE to the lazy waiters and the dictionary-like sommeliers as they have become the old-school-style resources i.e. time and cost consuming. So, if we say bye, then who will replace them? The technology is ready to replace them. Already, it has replaced them in many restaurants around the world. What technology is going to do to restaurants? The technology is almost helping every industry to do successful business in this fast moving modern world. The mobile devices are ruling the art of business proceedings as many people (nearly 81%) have started using mobile devices as their medium of communication and surfing. When it comes to the food and beverage industry, the mobile technology is acting as the new ambassador of every hotels and restaurants and even the food warehouses. In the last few months, restaurants around the world started implementing point of sale (POS) systems (especially iPad ordering systems) to make people order at their comfort. The following are some of the major benefits of implementing POS or iPad ordering system for your restaurant. In the modern world, many people own an iPad, and they love to use it as it has created a tremendous impact on the everyday task and activities they do. Since, iPad has become a daily staple, implementing a system targeting iPad is a useful step. The iPad ordering system is easy to implement and very cost effective as it helps reduce unwanted hassle and no-more-useful manpower. The iPad ordering or the POS system acts as the all-in-one server as it receives the order from the customers directly through the iPad placed either on the dining table or in a centralized area. It not only receives the order from the customer but also accepts payment either through the attached card swiper or online payments. Your patrons are sure to get the utmost satisfaction as the iPad ordering, or the POS system allows your customer to select the food of your choice and also to pay from the available options. The customer also can submit their feedback of the food they received. 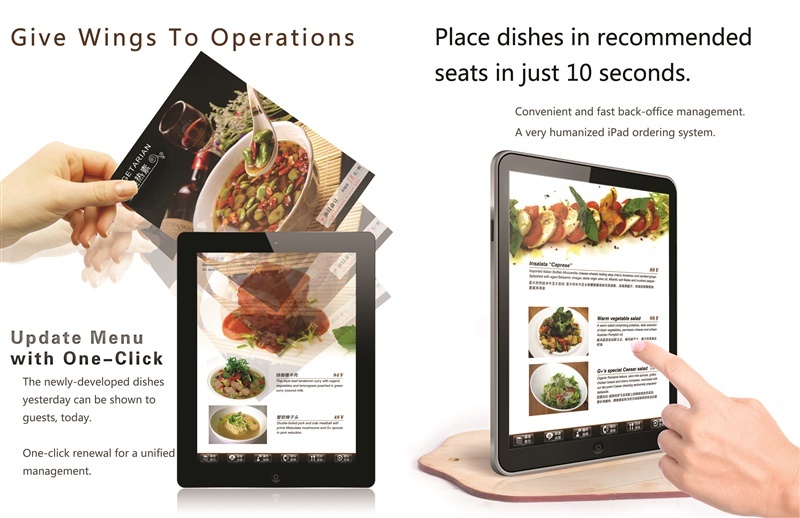 The iPad ordering or the POS ordering system is not only efficient for the customers but also for the restaurant owners. The system offers various analysis report of the customers activities that can be used for the betterment of the restaurant’s revenue. eMenu and iPad ordering system from 3Z eSolutions are rated one of the best iPad system employed by the restaurants and hotels around the world. The interface is very innovative as it invokes the appetite of your patrons with colorful and tasty images of delicious food. The system has not only colorful interfaces but also active features like flexible payment options, detailed reports and more. This Singapore company also offers products like Yumkiosk self-ordering and payment devices, thermal printers and many other.